Winter in Banff? 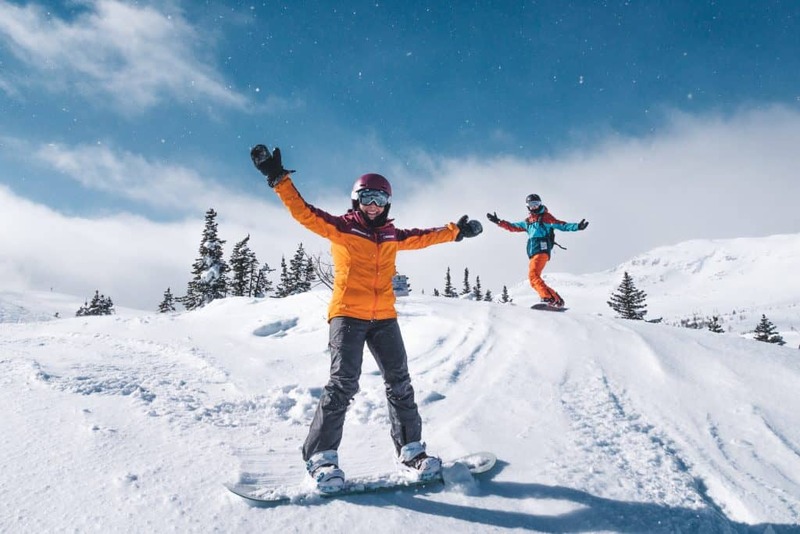 Visiting Banff in the winter means we must be crazy, or we really really love to snowboard, as Lake Louise and Banff Sunshine are easily two of the best ski resorts in North America. Instead of heading to the beaches of the Caribbean or Southeast Asia we decided to spend our winter tackling mountains with snowboards strapped to our feet. We urge everyone to not let the fear of Canadian snow deter you from traveling to Banff in the winter. You’re sure to be blown away by the beauty if you sacrifice palm trees and beaches and head north. If you choose the right spot, activities, and ski resort you’ll be counting down the days until winter just like summer. Truth be told, even now as summer is coming we’re already planning our next winter season. (Update: We decided to MOVE to Banff in 2019). 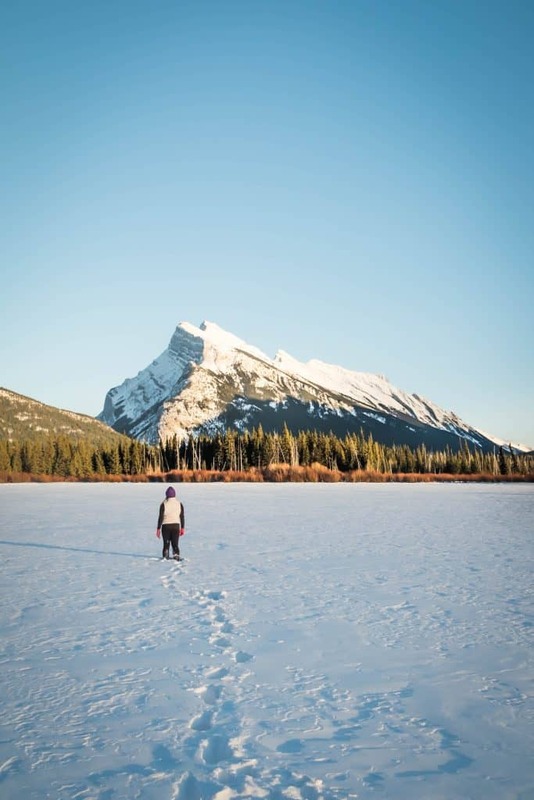 If you decide to make your way to Banff in the winter these are some of the best highlights. In this guide, we break down the best things to do in Banff in the winter, where to eat in Banff, and also a ski guide to SkiBig3. Snowboarding at all of the SkiBig3 resorts was our primary reason for heading to Banff in the winter. SkiBig3 is a collection of three mountain resorts all within Banff National Park. You have Lake Louise, Banff Sunshine, and Mt. Norquay which are all fantastic and unique ski resorts. I was standing in the middle of a massive chute watching Natasha’s snow rain down on me from the slope above. The run below me looked like a straight cliff and while standing I could touch the mountain, at least it felt that way. Banff Sunshine is a mountain that truly offers something to everyone from professionals right down to beginners. You can easily find yourself smack dab in freeride terrain that would be considered out-of-bounds in other resorts. If you want to find a mountain with some seriously humbling terrain in-bounds then Banff Sunshine is the place to head. Jagged peaks loom high above alpine trees and the views are unparalleled. When you first arrive in the parking lot the mountain does not look like much as the base is simply a gondola station and one restaurant. In fact, to reach the true resort base guests must take a 15-minute gondola that delivers them into a sprawling resort that looks like it belongs in the Alps, not North America. Banff Sunshine contains two expert only areas that require all riders and skiers to sign out with the ski patrol and carry an avalanche kit. Delirium Dive and Wild West areas feature massive cliff features, chutes, and some seriously steep terrain. Don’t let the expert terrain detract you from visiting the resort as it aslo has a plethora of groomed beginner and intermediate runs. The resort has something for everyone and the base area makes for a perfect central point to meet after skiing the surrounding peaks. There is arguably no ski resort in the world with a better view than Lake Louise Ski Resort, that photo above is what we’re talking about. In between runs screaming down groomers or tackling a bowl Banff National Park provides you some fresh air and stunning landscapes. We visited thirty resorts in one season and the views from Lake Louise were hands down some of the best in the world. It also happens to be one of the largest ski resort in North America with 4,200 acres covering four mountain faces. The terrain varies between beautiful groomers, challenging steeps, and expert level chutes. The longest run here stretches for nearly five miles so start working out your leg muscles now. Favorite Runs: Brown Shirt, Juniper Jungle, Men’s Downhill, Saddleback, Sunset Terrace, and E Chute. Mt Norquay is the most digestible of resorts here and the least imposing for beginners/intermediates. It’s only a 10 minute drive from the town of Banff, making it a great option to go get some runs in and still have time in town. The resort has been in operation since 1926 and offers a number of activities asides from snowboard and ski. It’s also the only mountain that offers night skiing in the area and relatively small in comparison to the other resorts of SkiBig3. While Lake Louise and Banff Sunshine can draw a decent crowd (still few lines) Mt. Norquay is a quiet mountain. 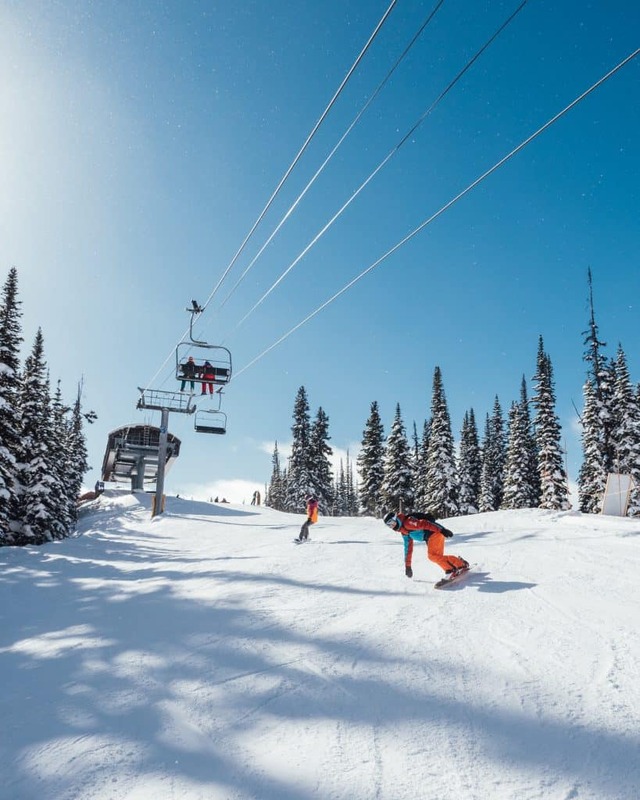 You’ll have a hard time finding crowds here and it’s the perfect place to learn how to ski with a good ski school and affordable lift ticket. They also offer snowshoe hikes, tubing, and child care. The biggest plus to Mt. Norquay for us is the proximity to the town of Banff, only a 10-minute drive. Favorite Runs: Constellation, Norquay 90 Glades, and Lone Pine. There are four national parks and a countless number of scenic mountain peaks, alpine lakes, and glaciers. In one of the most scenic places in Canada, you’re definitely going to want to take a large share of photos. You can also partake in a photography tour where they show the best places and how to get the perfect shot. We literally took this photo after pulling over for just a few minutes. It won’t be hard to get beautiful photos here! There are a number of great spots to take photos in the winter. Vermillion Lakes, Bow Valley Parkway, and Lake Louise are great places to snag a great photo or you can drive all the way up to Jasper for a multitude of more places. Have you ever stood on a frozen waterfall before? Neither had we until the Johnston Canyon hike. 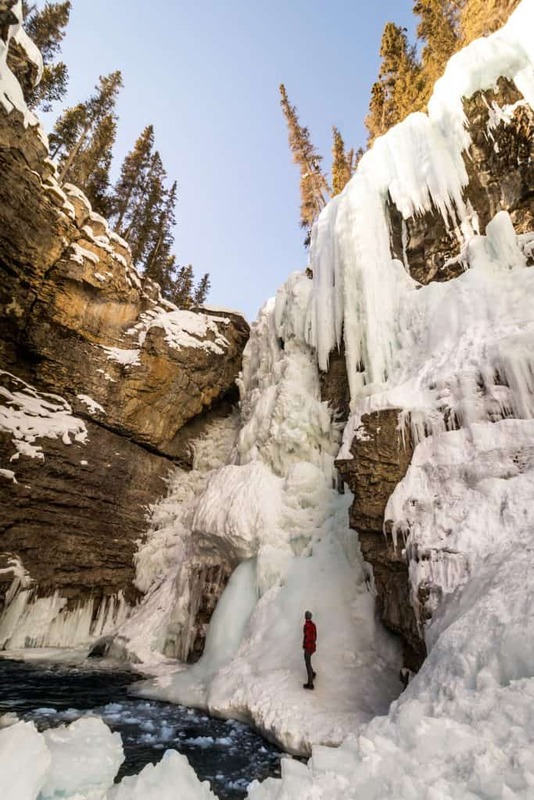 Due to the elevation of the region and the sub-zero temperatures of winter the waterfalls of Johnston Canyon freeze in time. It’s a pretty surreal experience and completely accessible for all. As a tip, we suggest picking up some ice cleats in town. Although the trail is well managed it can get icy and it’s better to slip everywhere on the trail – ours were very handy! Once you reach the end of the trail and the most impressive frozen fall you’ll probably find some ice climbers. If you’re feeling adventurous book an ice climbing tour yourself! A great thing to do for families visiting Banff in the winter is snowshoe! Just because there is snow on the ground doesn’t mean you can’t leave the well-trodden path. You might not be able to walk through the snow on foot, but a quality of a pair of snowshoes allows you to float across the snow. They’re super easy to get the hang of and you’ll be moving along in no time. 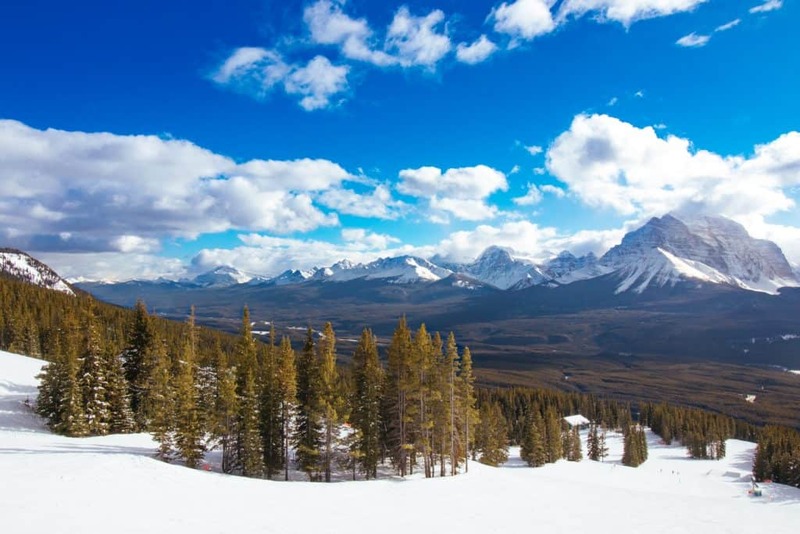 Two popular snowshoe hikes are to the Paint Pots or Marble Canyon, but you’re free to explore the wilderness on your own if you rent a pair. You’ll be hard-pressed to find a more scenic ice rink than Lake Louise. Every year the lake freezes over and the Chateau Lake Louise marks out multiple ice rinks made for families, figure skating, and hockey. Nothing screams you’re in Canada than playing hockey on a frozen lake. There are a number of places around that offer ice skates for rent, including Chateau Lake Louise. 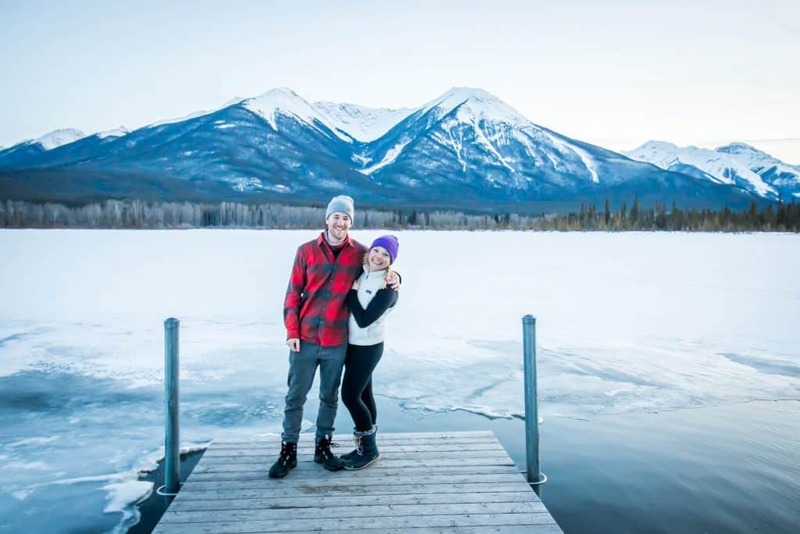 If you’re not much of a skater don’t worry – Lake Louise freezes completely over every winter providing you the opportunity to walk and explore the area. I personally don’t like cross-country skiing, but there are plenty who love to cross-country skiing. It’s a low impact sport that gets your heart racing and allows you to slide across the snow. There is one thing you can’t argue against is the pristine wilderness beauty nordic skiers will find themselves, especially in Banff. Don’t let the frigid Canadian temperatures detract you because there are plenty of ways to warm up around the Banff. Just outside of the Banff town lies the Banff Upper Hot Springs. These hot springs make for one of the best places to relax those stiff muscles after a ski day. Just be warned afternoons can draw a crowd so head there in the morning for a more quiet experience. We have an addiction to the post excitement high we receive in the mountains. After flying down a mountain on our snowboard nothing beats the feeling of calming our nerves in nature. There are a countless number of ways you can relax whether it be by a hot tub, on a bench, by a fire, or watching the sunset over the frost-tipped mountains. Just kick back with the one you love and let the calming effect of Banff National Park wash over you. Nothing else can compare to this when visiting Banff in the winter. We love sushi and we love a good deal so Banff Sushi is a slam dunk for us. The novelty of sushi train was definitely appreciated and brought us back to Japan as we nabbed tantalizing bites of sushi off the Canadian train engine. If you like sushi this may be one of the best deals in Banff. Hip coffee shop serving delicious coffee and freshly baked treats. It’s the perfect post ski pick me up if you’re not into the apres ski scene! Check out the only distillery in a national park in North America. It’s super cool inside with large tables perfect to finish off a winter day in Banff with friends or family. This healthy cafe is the perfect lunch spot in town with reasonably priced lunch combos and coffee. Winter activities often mean you’re burning plenty of calories so if you’re looking for a laid-back atmosphere and some tasty grub head to this tavern to replenish. Our favorite post ski ritual is to check out the local brewery, something you can only find in North America. To find some of the best brews around go to the neighboring town of Canmore. Stay: We stayed at Elk+Avenue hotel in Banff which had a great location right on the main street and across from a grocery store. Rooms here are comfortable and spacious. For apartment rentals in Banff consider looking at Airbnb. You can read about choosing a good Airbnb here. Here is a coupon for your first stay with Airbnb! Travel Insurance: We never travel without travel insurance with World Nomads. World Nomads offers incredible flexible and great plans! Water: Please consider purchasing a travel water bottle before your trip! We hate to see one time use plastic bottles ending up in the ocean. We found the tap water in Canada fine to drink, but when we want extra assurance we use the Lifestraw Go Waterbottle. Travel Credit Card: We take full advantage of credit cards. If you’re Canadian check out this new offer from Scotiabank. For example with their credit card, you have no foreign transaction fees, spending rewards, a signup bonus, and other sweet perks.